This story is the first of five where Jesus enconters conflict. Jesus becomes controversial in the eyes of some, particularly the religious leaders. Jesus forgives sin, eats with sinners, defies the traditions about fasting, and heals on the sabbath. Jesus does not conform to the traditons of the elders and he assumes a role in the community that disturbs devout leaders. Though still widly popular, opposition begins to emerge. The healing of the paralytic dropped through a newly made hole in the roof of Peter’s house at Capernaum has long captured the imagination of believers. The earliest pictorial representation of Jesus (ca. 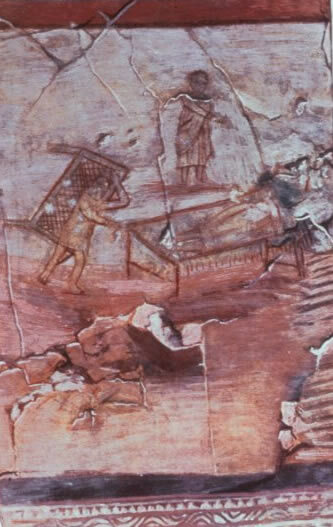 235 CE) was found in a fresco on the wall of a baptismal chamber in the house-church of Dura Europos (located in modern Syria). The fresco depicts the healing of the paralytic. Jesus appears at the top center and is pronouncing the punch line of the Marcan story: “that you may know that the Son of Man has authority on earth to forgiven sins, rise up, take up your bed and walk” (2:10-11). On the right the man is lying on his bed, and on the left the man is walking away with his portable cot. Significantly, this fresco is located in the baptismal room where believers were baptized for the remission of their sins. It is a symbol of redemption–forgiveness and healing. This illustrates how the early church understood the central point of the story. The key line in the story is “the Son of Man has authority on earth to forgive sins” (2:10). This statement has some powerful language: “Son of Man,” “authority,” and forgiveness. “Son of Man” is title that only Jesus uses in the Gospel of Mark, and it is his favorite self-description. It does not refer primarily to his humanity. Rather, the title projects an eschatological role where authority and power belong to the one who reigns from the throne of God. If not a divine title, it is at least an exalted one where the person who is the Son of Man is worshipped, honored and obeyed by all creation and all the nations upon the earth (cf. Daniel 7:13-14). It is his role as Son of Man that authorizes him to forgive sin, a divine prerogative. When Jesus absolves the paralytic of his sins, the “teachers of the law” are horrified. Inwardly–probably fearful of public reaction–they accuse him of blasphemy as only God can forgive sins. The teachers understand that Jesus is making a claim in this statement. He is asserting some kind of relationship between God and himself that authorizes him to forgive sin. This is, in the minds of the teachers, presumptive and blasphemous. It arrogates to himself a divine function. The healing of the paralytic authenticates and verifies the blessing Jesus gave to the diseased man. Why Jesus decided to forgive his sins when he apparently came for healing is not stated. Perhaps Jesus saw some connection between his illness and his sin. Perhaps sin is the more fundamental problem. Perhaps it was to provoke controversy. Or perhaps Jesus wanted to use his healing in order to highlight “the word” he was heralding. The healing demonstrates the presence of the Son of Man and so does the blessing, “Your sins are forgiven.” Forgiveness and healing are linked, in the ministry of Jesus, to the presence of the kingdom of God. This is the message, the good news, of Jesus (Mark 1:14-15). When the kingdom of God shows up, people are amazed. They see in the presence, acts, and words of Jesus something new–a new work of God in the world. They see the kingdom of God. The Son of Man heralds good news and he implements the good news through forgiveness and healing. As we read this story, it is possible to see ourselves in different ways. Who are we in this story? Are we followers of Jesus who bring good news to the sick and unforgiven? Or are we in the crowd–people filled with wonder, amazement and worship in response to the acts of Jesus? Or are we the friends who help bring others to Jesus? Or are we paralytics in need of healing and forgiveness? Or are we the teachers who question, doubt, and opposes the good news in action? We read this Gospel to discover ourselves. We do not read it simply to get the facts, but to participate in the story. Discovering where we are in the story illuminates the story of our own lives. It will shape our identity if we immerse ourselves in it. This entry was posted on September 24, 2011 at 10:45 am	and is filed under Biblical Texts. Tagged: Authority, Bible-Gospel of Makr, Forgiveness, Healing, Mark 2:1-12, Paralytic, Son of Man. You can follow any responses to this entry through the RSS 2.0 feed. You can leave a response, or trackback from your own site.